It’s spring in the northern hemisphere and that means it’s time for caterpillars and butterflies! My former students and own kids love to sing and act out caterpillar and butterfly themed preschool songs, they are perfect for circle time at school or play time at home. Where, oh where, did my caterpillar go? Where, of where, did my caterpillar go? Oh look! It’s a butterfly! As the students sing the beginning lines of the song they cup their hands around their eyes as if they were looking for something. When they sing the last line of the song they point their fingers up to the sky at the pretend butterfly. Soon you’ll be a butterfly. And fly away. Fly away. The kids cup their hands and swing them gently back and forth in front of their bodies while singing about the caterpillar. They hook their thumbs and flutter their fingers like wings during the third and fourth line and then move their butterfly fingers up into the air for the last line. So that he can see! Singing and acting out finger play songs is a great learning activity for kids. 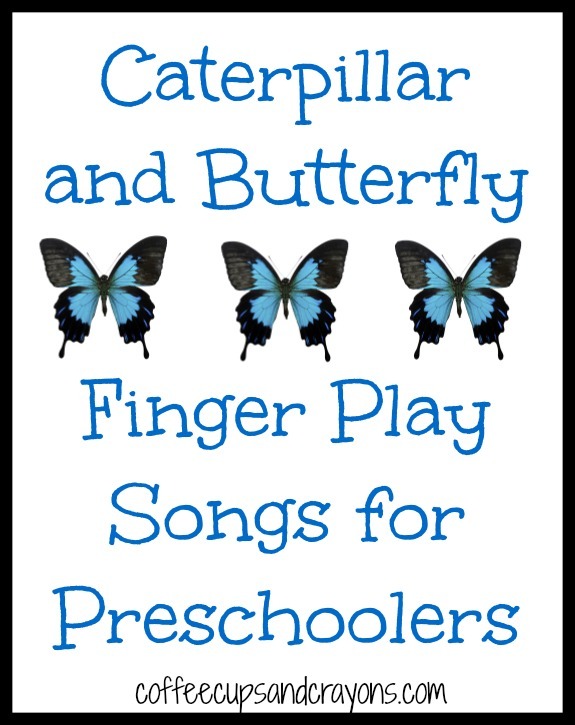 Preschoolers and toddlers can practice following directions, using memory skills, and learn about the life cycle of a caterpillar while singing and having fun. If you are studying about the caterpillars and butterflies you may want to make our 12 eyed caterpillar puppet to go with the life cycle song! These are perfect for our household…we love to learn through singing! Ha! Great minds think alike Shaunna! I just did! These are so cute! My kids will love them! You just may want to turn down the sound on the video so they don’t have to listen to me sing! Ha! These are so cute! I love the one you wrote. Thanks so much Deidre! I hesitated a little before posting so I appreciate the comments! Adorable videos! My daughter is a ‘learn thru singing’ kid too so we love learning new songs. Thanks so much for linking up at Discover & Explore this week! Great rhymes! I have used them in kindergartens in Asia!